SFI Warehouse Sale is HERE again! s at up to 70% off! Do look out for our star buy items, which include Chilled Australia Wagyu Striplion, CJ (Korea) Dumplings, Liv butter banded with ‘Lock & Lock’ container, Farmpride Fish Bites, and many more! 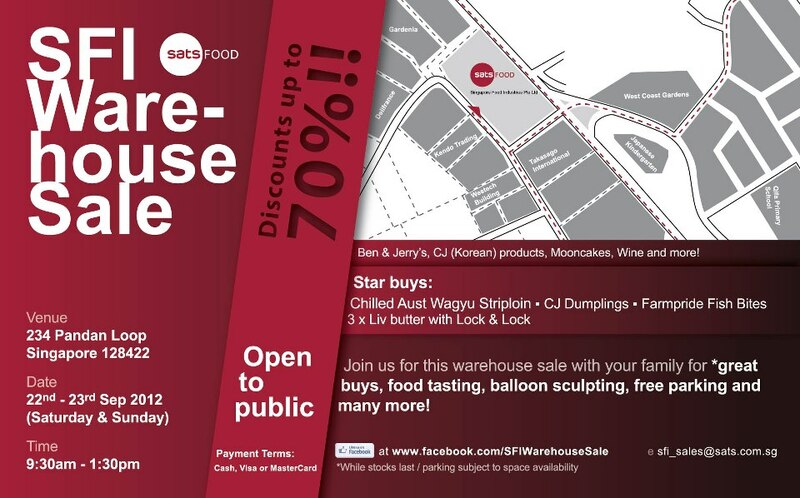 There’ll also be on-site sale of Moon cakes, Ben & Jerry’s Ice Cream, Fruits & Vegetables, etc at attractive prices! Experience Massive Savings! Be sure not to miss out on these amazing deals and discounts! *Food sampling available for selected products only and all items are while stocks last! *Free balloon sculpting for kids and the young at heart!